One of the head-to-head matchups between ranked teams on Saturday’s Week 6 slate sends the No. 6 Notre Dame Fighting Irish on the road to face the ACC’s No. 24 Virginia Tech Hokies in an 8 p.m. start on ABC. The Fighting Irish have gone a perfect 5-0 straight-up with a 3-2 record against the spread in their first five games. They have already posted victories against Michigan and Stanford SU and ATS to climb the ranks in the national polls. The total went OVER BetAnySports’ 53.5-point closing line in last Saturday’s 38-17 win against Stanford as 44.5-point home favorites after staying UNDER in three of their first four games. Notre Dame’s offense is averaging 442.4 yards per game with an excellent balance between the pass and the run. This has added up to an average of 32.8 points per game. Ian Brook has tossed seven touchdowns and Tony Jones Jr. has added another three touchdowns running the ball. Defensively, the Irish are ranked 27th in the nation in points allowed (18.8). Virginia Tech was on the fast track to all the way to No. 13 in the AP Top 25 before suffering one of the most stunning losses in recent memory with a fourth-quarter meltdown against Old Dominion as a 28-point road favorite. 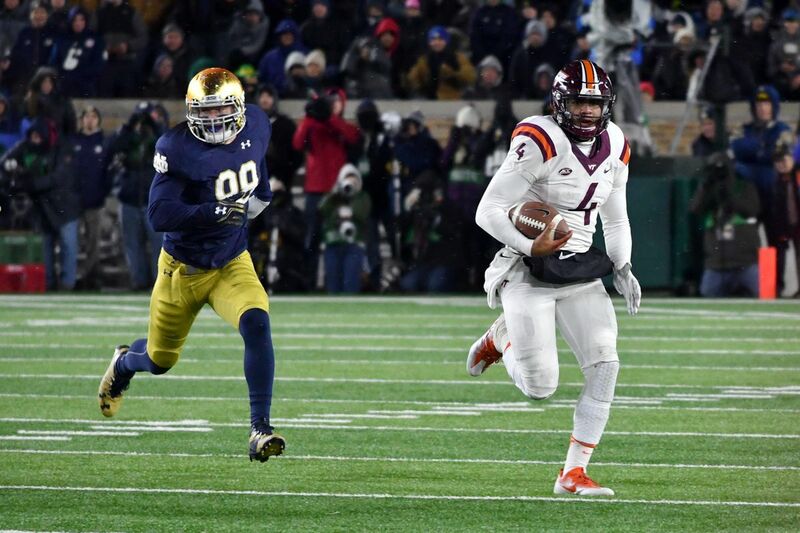 The 49-35 loss knocked the Hokies out of the rankings, but they slid back in at No. 24 with last week’s 31-14 road victory against Duke as 6.5-point underdogs. Overall, they are 3-1 both SU and ATS with the total evenly split at 2-2. Josh Jackson leads Virginia Tech in passing yards with 575, but Ryan Willis got his first career start against Duke and threw for 332 yards and three touchdowns. The Hokies defense had allowed a combined 20 points in its first two games before falling apart against ODU. It was able to regain its form by holding the Blue Devils to 327 yards of total offense. Notre Dame is on a mission to make it into the College Football Playoff and it needs as many impressive wins as possible to sway the voters. This adds up to another victory on Saturday night against a ranked team both SU and ATS.